As of recently new version of SWF Protector for Mac by Dcomsoft is available for downloading from their website and treating the SWF files with a quality protection. 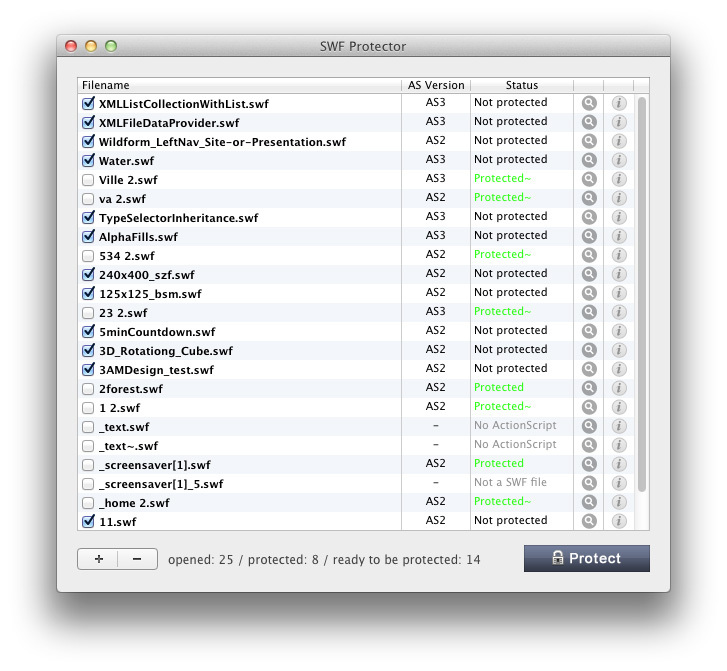 SWF Protector 4 for Mac was released on September 21, 2011 and features an innovative and unique protection algorithm for ActionScript 3.0 code. ActionScript 2.0 can be protected with two algorithms: “Mix script” and “Mask script”, and both of them were greatly improved in this fresh release. New SWF Protector processes SWF files really fast because of the optimized working mode: most of the manual settings were removed in favor of the automated ones, i.e. now you don’t have to customize the protection settings for each and every SWF file, but SWF Protector will do that for you. The interface of SWF Protector has changed too, it became better actually and is more comprehensive and easy-to-use now. The main function of SWF Protector works as one, two, three: you just add the needed SWF files to the protection list and click “Protect” button. After that SWF files become fully protected from all decompilers. Altogether SWF Protector is an ideal soultion for those who need their projects to be really protected no matter if they were created in Flash or Flex programs. All versions of ActionScript are covered and that is a good thing too. Where can this awesome software?